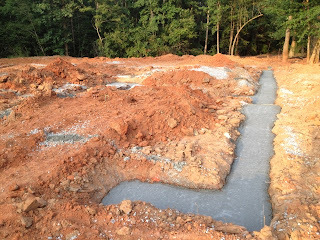 We were there to watch the foundation poured. The past week has been hard and bittersweet for me. I've watched things I dreaded come to pass and am trying to come to terms with our new situation. First of all, my wasp sting DID get infected and I had a big reaction to it so today I am still sitting around in my robe not feeling well. I was able to get in earlier this time so at least my leg hasn't turned black, but I am all doped up. 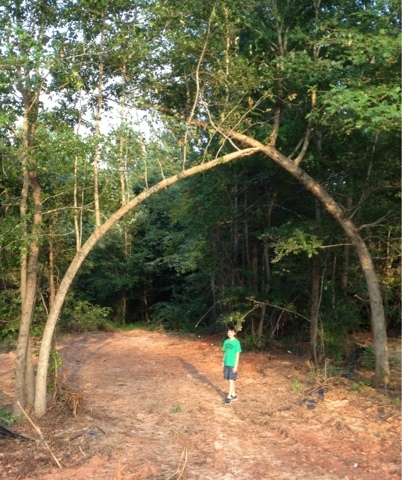 The construction manager has been working to try to preserve this natural archway to the backyard. For the past several months I have been working on a project I didn't mention much here: a new home! 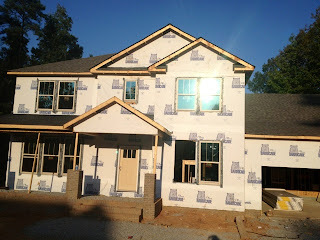 You may remember we worked so hard to sell our house and have been living with my parents while we waited for the new house (my "Mother's Day present") to be finished. 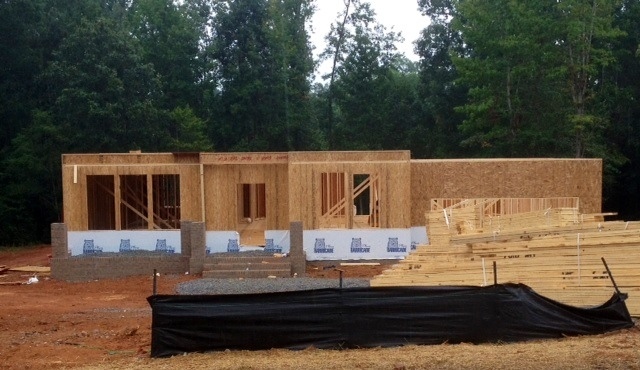 We have celebrated every board and nail going up and were set to move in about 3 weeks from now. We were so thrilled to see the walls go up! You may also remember I was worried about my husband's company merging with another. Well, I was right: we just found out we have to move across the state (possibly over the line to South Carolina) and we won't get to live in our new house! So all the work to sell the old one and the discomfort of squeezing our entire family into my parents' upstairs was for nothing. 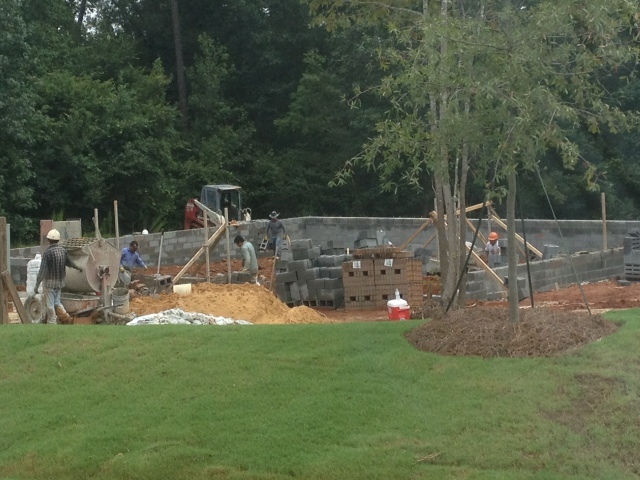 Luckily, the company is buying the house we were building and paying for the move. It is also a great opportunity for Jerry. I am happy for him, but I am struggling to adjust. I find myself grieving for the house almost like it is a person I have lost. It's funny, because when we were walking through the model and all this time I haven't quite been able to believe it would really be ours. I told Jerry I felt like it was too good to be true that we could actually own a house like this. Rain didn't stop us from walking through before the roof went on; we used umbrellas! I have a particular problem with big changes like this. I have watched so many things I hoped for slip away over the years I always mistrust good fortune. I never want to enjoy it for fear I will get hurt. I am trying to tell myself it's all for the best, and I'm sure it is. The new area has a lot of lakes and hills, so you're more likely to get a house with water and a basement. We may get an even better house. We could actually build with the same company, except that the thought of waiting another 6 months for a house is just more than I can bear right now. I do want to give a recommendation for the builder, though. 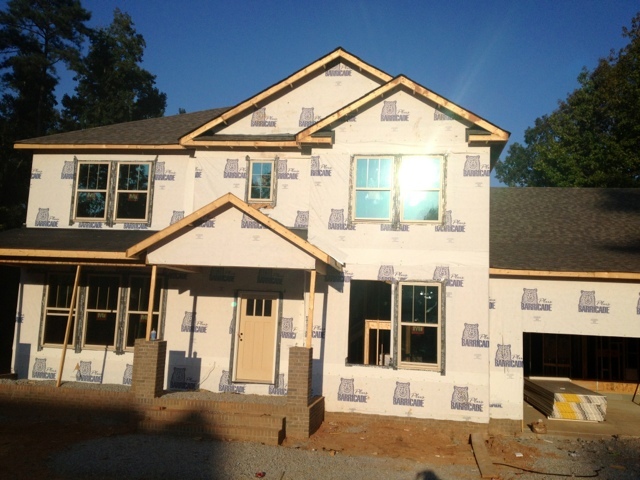 Meritage Homes is the company and it's wonderful. They are a green builder and they add so many really nice details you just can't believe what you're getting for the price. If you have this company in your area I encourage you to look into their neighborhoods. The neighbors near our house have been so nice to us, too. 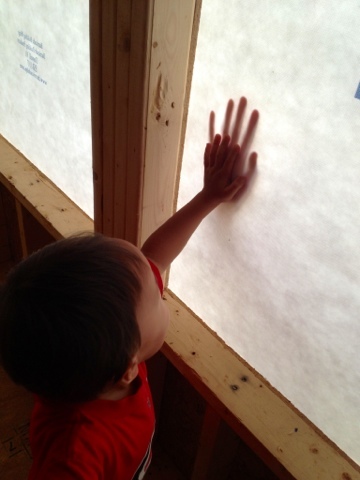 We have already had the new next-door neighbors offer to babysit while we met with the construction manager! I am heartbroken to leave them! Our sons touch hands through the house wrap. Anyway, I will get over all this and move on, I'm sure. But I just wanted to take a moment to write a little tribute to the beautiful house we've built for some other family. Maybe if we ever move back here we can buy it back! This is the last picture I took when it was still ours. 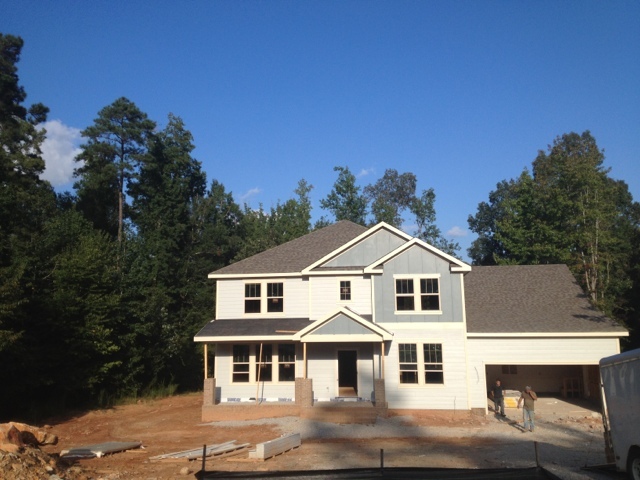 I love the blue-gray siding! I have packed up my house three times for opportunities that have fallen through at the last minute for one reason or another so I can appreciate how you are feeling right now. I know there is a reason for everything(even bee stings)and you are in my thoughts as you prepare for your next adventure in life. It will be exciting. Take care.